You like the cool XKCD Look and Feel of the teaser chart? Then this post is what you are looking for! The chart is derived from the pie_demo_features.py and slightly adapted to the topic of this post. This post shows how to set up all the tools needed to create your own XKCD-style charts. 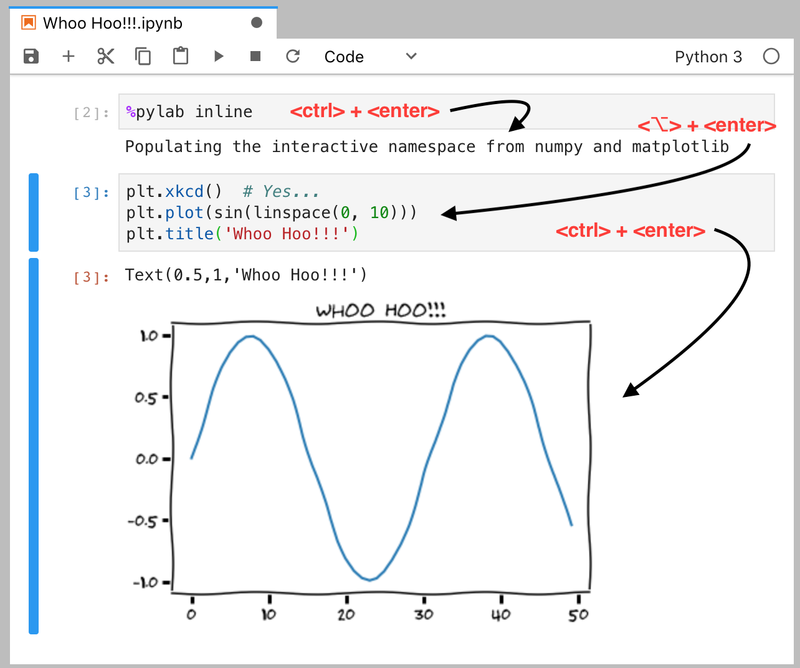 A while ago a friend hooked me with his cool classroom setup which he uses to teach Python: Jupyter Notebooks and Matplotlib with inline preview. XKCD Plots have Landed in Matplotlib! Finally, I found some time and decided to prepare a local setup. Since it wasn’t a simple one-liner I decided to share a Docker setup. There is already a good bunch of Jupyter Docker Stacks out there to Selecting an Image from. Since we want Matplotlib we go for jupyter/scipy-notebook. That was the one-liner I thought would be enough. But it wasn’t. It gave me some error messages when loading the font HUMOR-SANS. xkcdsucks is proud to present HUMOR-SANS, the xkcd font! An additional rm -rf /home/jovyan/.cache/matplotlib/ fixed the problem for me and the plots picked up the proper font. Let’s put the setup into a Dockerfile. Note: The snippet above sets the token to xkcd which you’ll need when first accessing Jupyter locally. The Mac version of the Whoo Hoo!!! example for absolute Jupyter beginners. Tip: Hitting <ctlr>+<enter> will execute the code and result in the output shown above. Another <ctrl>+<enter> will print the chart inline. # The slices will be ordered and plotted counter-clockwise. Note: You’ll have to add this command within the same code box as your graph. Otherwise, an empty image is created. What’s next? Clone the fwaibel/xkcd-notebook setup and get started!